In Jacksonville, boat storage is an important part of enjoying your weekends on Florida's beautiful waterways. We have indoor as well as outdoor spaces available for storing your boat, RV or travel trailer. Our secure facility is fenced, gated and equipped with 24-hour surveillance cameras to ensure your boat is safely stored between trips. 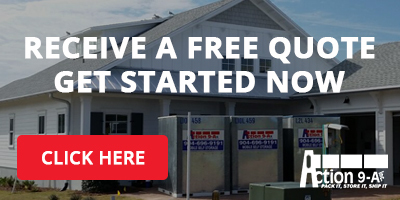 Get a Free Estimate today by filling out the form at the top-right of this page. Our self storage facility is conveniently located off Jacksonville's 9-A perimeter road and features climate controlled storage with keyless entry. For added safety and security, we have 24-hour surveillance cameras and motion sensors to turn lights on near your self-storage unit at approximately 30-minute intervals. Regardless of what you need to store, Action 9A can help with your storage needs, call us today at 904-696-9191 for the best rates for moving and self storage in Jacksonville. Learn more about Action 9A's Jacksonville Self Storage Specials.